Whenever I come across someone who inspires me style wise, I like to share it. 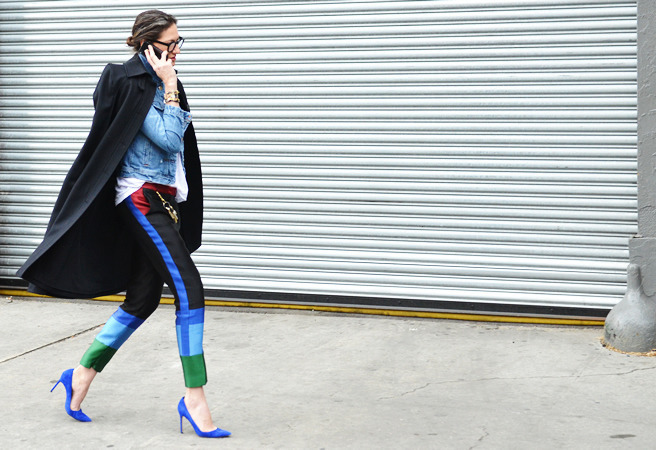 My fashionista for this post is Jenna Lyons, Creative Director of J.Crew. Jenna is truly a style icon in and out of the workplace. I recently stumbled across a picture of her from Solange Knowles' wedding, and my obsession with her revamped. This outfit is stunning, I was talking to my cousin about it, and we both agreed THIS is how you dress to go to a wedding! From the texture of the fur and the feathers, this is a truly a killer outfit! I started following Jenna Lyons around 2011 when I really started investing time into J. Crew. Jenna has worked as the President and Creative Director of J. Crew since 2008. She has transformed J.Crew from what used to be a bland brand, to a true staple of creative and innovative fashion. Can we please just take a minute to realize the fabulousness and versatility that is Jenna Lyons? She, to me epitomizes what I look for when I think of style. With grace, elegance and an amazing pair of glasses, Jenna is fashion. I can thank her personally for some of my most stylish outfits, because J. Crew has impacted me and my style so much. Winter Fashion from Piperlime and Pinterest!